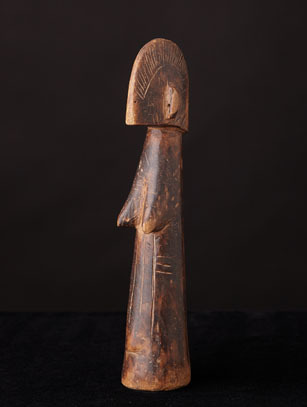 THE MOSSI DOLLS ARE CARVED FROM WOOD BY VILLAGE SMITHS & CARVERS. THEY ARE USED FOR PLAY & MAGIC. THE FEMALE FIGURE IS ALWAYS DEPICTED WITHOUT ARMS & LEGS. SOMETIMES THEY ARE COVERED WITH SHELLS & LEATHER. QUITE A FEW OF THE MOSSI DOLLS HAVE A DOWNWARD PROTRUSION FROM THE FOREHEAD REPRESENTING THE HAIRDO OF AN UNMARRIED MOSSI GIRL. 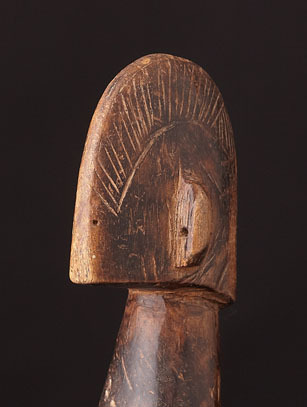 A LARGE NUMBER OF THE MOSSI DOLLS ARE PHALLIC IN SHAPE INDICATING FERTILITY. EVEN SCHOLARS HAVE DIFFICULTY DISTINGUISHING WHICH DOLLS ARE USED FOR PLAY AND WHICH ARE USED FOR MAGIC. A FEW SCHOLARS BELIEVE THAT THOSE DOLLS THAT ARE RUBBED WITH PALM BUTTER INDICATE MAGICAL USE.